Following up on the kind of success Jordan Peele had with directorial debut “Get Out” was always going to be an anticipated event, hard to satisfy. “Us” will please the fans who discovered “Get Out” before it became a phenomenon and Oscar winner. What it won’t do, is make the leap to awards contender or bring in audiences who typically stay far away from the horror movies. That doesn’t mean it’s a bad film, it’s just different. 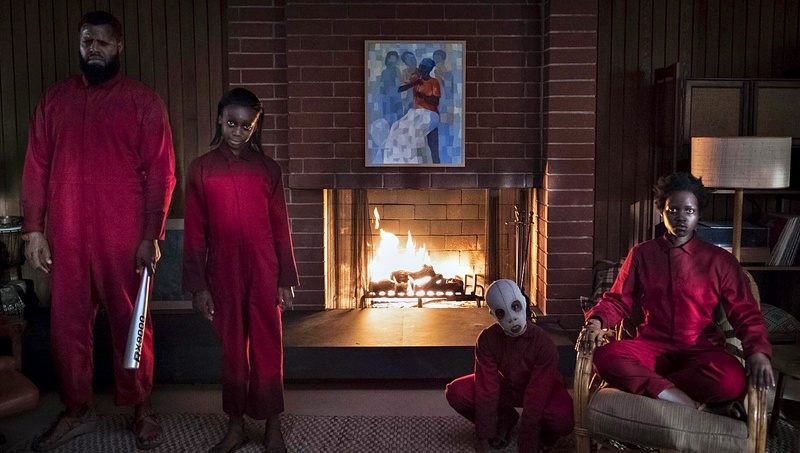 Peele’s newest work leans more into horror elements, aka producer Jason Blum’s wheelhouse, and moves slightly away from Peele’s comedic roots. Like its predecessor, “Us” has a message, but its underpinned by genre and action elements. Oscar winner Nyong’o (“12 Years a Slave”) is very good in the film, playing against everything in her filmography up to this point. The Wilson family has just arrived at their vacation home in Santa Cruz. Each time they visit, Adelaide(Nyong’o) gets anxious. Her husband Gabe (Duke) and the kids are excited to go down to the beach, but Adelaide struggles with trauma that occurred in her own childhood, near the same beach. After a successful start to their vacation, one evening Jason (Alex) the youngest, casually asks why there is a family standing in the driveway. Adelaide and Gabe first think it’s a joke, but the situation turns dire when they realize not only is there a family standing in the dark on their property, but the four individuals look exactly like The Wilson family. “It’s us,” Jason says when they all come face to face. It’s survival of the fittest as terror breaks out on the quiet neighborhood and anything you can grab becomes a weapon. “Us” will please the fans who discovered “Get Out” before it became a phenomenon and Oscar winner. What it won’t do, is make the leap to awards contender or bring in audiences who typically stay far away from the horror movies. As far as home invasion movies go, “Us” works at getting the audience riled up, on edge and maintaining a level of suspense that will please those looking for Friday night thrills. While it doesn’t solely depend on jump scares and other genre tropes, they are certainly part of the framework. However the length that Peele’s script keeps the audience guessing is a bit too long. For those that came to “Get Out” after it reached a fever pitch, you expect more than just suspense, and you don’t want to wait until the last ten minutes to get it. For much of the first and second half of the film, the audience is asked to go along with the thrill ride, without asking questions or being given enough pieces to complete the puzzle. However, those desensitized by the horror elements will be trying to guess the ending, and it becomes fairly obvious after only a few flashbacks. Tension is often broken by moments with the two young stars, Shahadi Wright Joseph and Evan Alex, who rise to the occasion of defending their family in a way that surprises the parents as much as it does the audience. If “Get Out’s” brain surgery was the biggest sci-fi element for realists to swallow in that movie, “Us” raises the stakes. The further Peele takes us from reality, the more dismissible the whole film becomes. Would “Us” look and feel like a stronger movie if “Get Out” never existed? We’ll never know, but as it stands, “Us” is likely to be as successful based on curiosity and faith in Peele, just not as prestigious.